Bathua (Chenopodium greens)is a green leafy vegetable that comes in winters only, seen in North Indian markets more than the other parts of country, much prized for it's unique mild taste. Yes all greens have their own distinct taste although many staunch non vegetarians always complaint they all taste the same. It is loved in my household in the form of Bathua ka raita, Bathua ki kadhi , Bathua ka saag and Bathua ka paratha in a few avatars. This time I made this Bathua ka paratha with Barley flour that makes it largely gluten free (if the Barley is not processed in presence of wheat). We have always like such parathas with a bowl of fresh curds and a raw chutney made using Amla and raw soaked chana daal (split chickpeas). 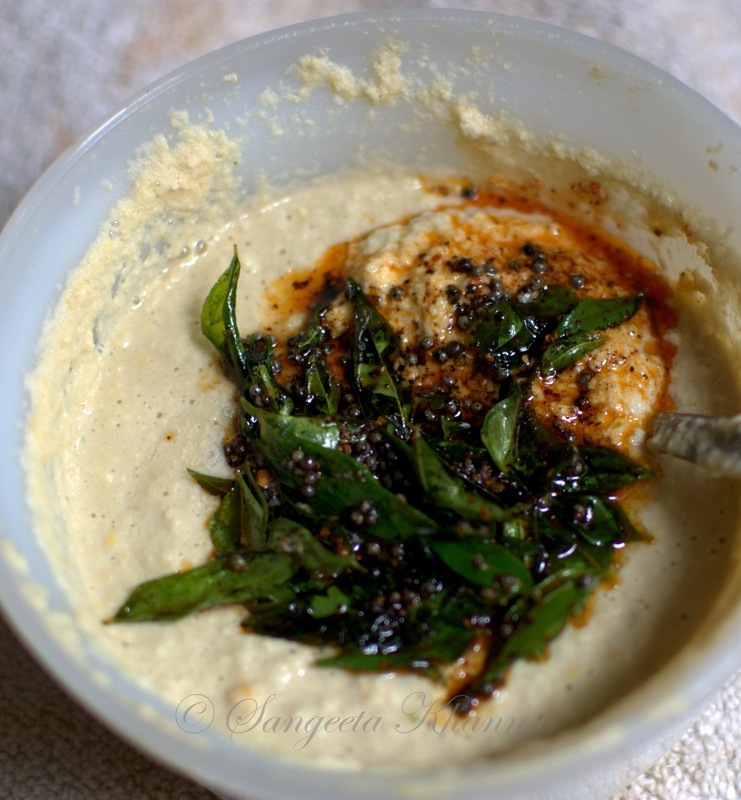 This chutney of daal and Amla is also made in different versions depending on the flavors I want on a particular day. 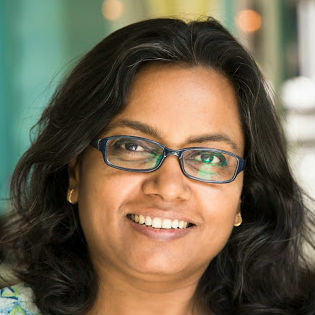 Here is how Bathua greens look. 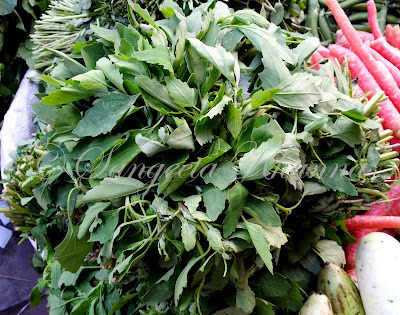 I clicked this pictures when I spotted a bunch of fresh greens in a street market in Old delhi. These need to be cleaned, the hard stems removed and washed repeatedly rinsing the greens well, a lot of work to be done but totally worth it. The washed greens are steamed first, I prefer doing it in the microwave, just cooking covered for 2-3 minutes (300 gms or more) covered is enough to make the greens go limp. Then the greens are made into a paste, sometimes with garlic and green chilies but this time it was plain. The green paste is used to knead a dough, this time using Barley flour. Small portions of this dough is used to roll out chapatis and is roasted over a hot griddle with ghee to make parathas. 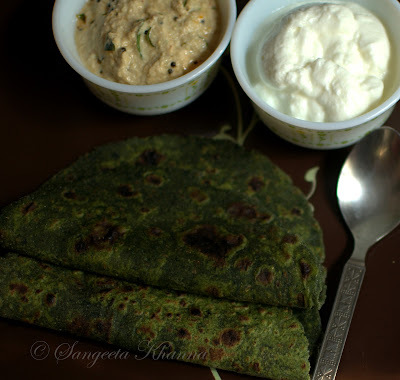 Nice and deep green parathas that are soft when hot and stay warm even when cold as the green leafy fibers keep it moist. half a cup of chana daal is soaked for 3-4 hours or overnight..
Now this raw chutney with a hot tempering is ready to be enjoyed with anything you wish. 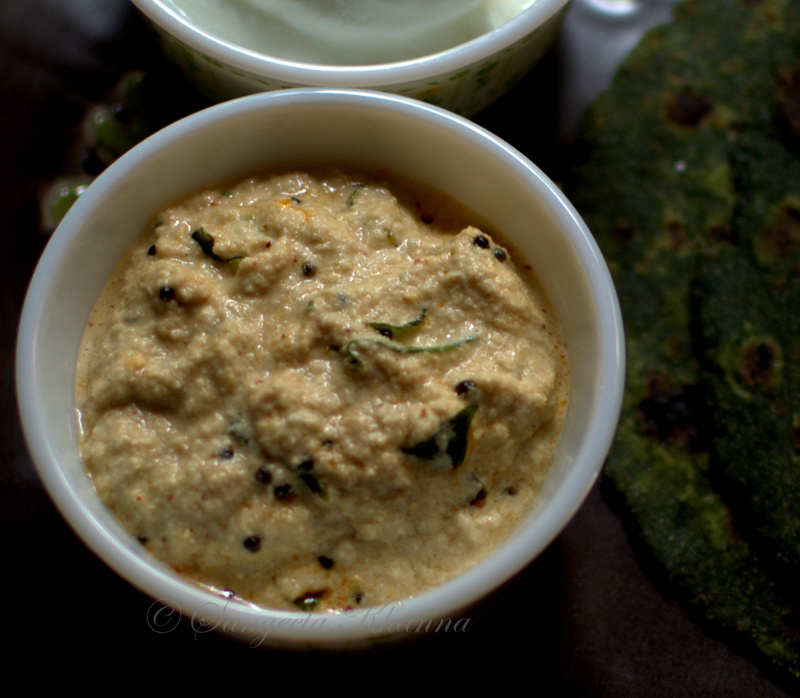 For us it makes an accompaniment to idlis and such green parathas sometimes. Healthy meals are easier to assemble during winters I always feel. There are so many flavors and fresh greens and vegetables available all around. Easy and affordable nutrition. 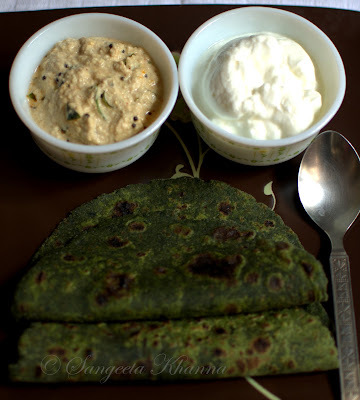 Make this paratha using any greens you get in your part of the world. This chutney will be as good with tomatoes or cranberries or even lime juice and some coconut thrown in. Try this and let me know if you like. 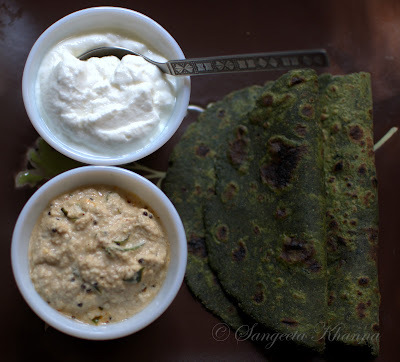 unusual greens : Bathua (Chenopodium greens) : a paratha and a raw chutney..
Can you store this chutney in the fridge if made in larger quantities? How about adding some garlic to it? 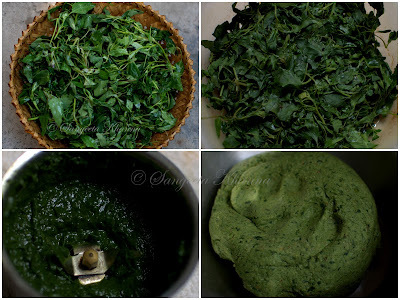 Hope I can catch hold of bathua else will have to make do with palak. Thanks for the detailed recipe. 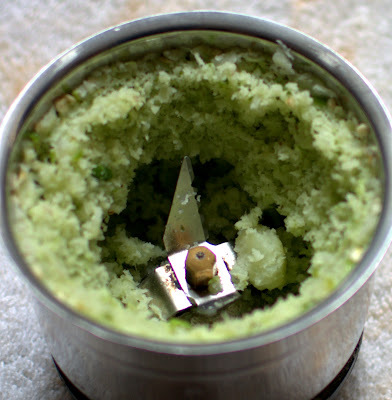 Yes this green paste can be refrigerated and can be frozen to. Garlic can be added and ajwain too. The other recipe linked here is a lasuni bathua ka paratha posted 3-4 years back. And if you are asking about the raw chutney, that would stay in the fridge for a couple of days only and yes garlic makes a nice addition to the chutney always.. aah!! my mum makes awesome bathua paranthas exactly this way...sometimes she even makes rotis from them! !